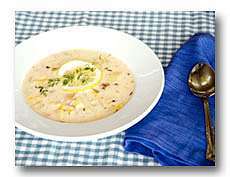 This fish chowder recipe can be the base for many different combinations of fish or seafood. I love fish - well, look at my website - but it smells when it's cooking and there's not a lot you can do about that. So - while you're in the great outdoors how about trying this recipe for fish chowder? You will probably enjoy it so much that you'll cook it again at home - just open the windows. You can still use a gourmet chowder recipe even when camping. You could even use your catch of the day which will get the fishermen (or women of course) involved in preparing the meal - well, why not? Use this as a trout chowder recipe for that fresh catch on your camping trip. It seems a bit of a drag to prepare the stock, but, don't worry, because you could just use wine and water instead. I know we have visions of long, hot summers, but sometimes (well, in England anyway) they're not and this fish chowder would be great on a cooler evening. It's a substantial meal and I would serve it with lots of fresh crusty bread and butter. I have substituted canned mussels (or clams) and sweet corn - you could of course use canned crab or shrimp if you find those easier to buy. Put the fish trimmings, water, lemon rind, salt and pepper into a pan. Simmer for 30 minutes. In another pan, fry the bacon until the fat runs. Add the onion and garlic and cook gently - you might need a little butter if there is not enough fat. Add the potato and coat in the fat. Gradually add the strained stock (or water and wine) and cook for about 25 minutes. Add the milk and butter to the soup when the potatoes are soft. Add the fish and drained mussels and sweet corn and cook a further 5 minutes. Serve the seafood chowder at once with crusty bread. We all know fish is good for us - if you want more seafood in your diet but are stuck for ideas then visit Find-a-seafood-recipe.com where you will find hundreds of different ways of serving fish. From canned to live (and lots of dead ones in between! ).